The Diesel Timeframes Mega Chief Chronograph Quartz DZ4478 Men’s Watch boasts of an industrial design. Now, those who have no idea what industrial is might take delight in knowing it as an ornamental appearance that’s machinery-inspired. This particular aesthetic aspect makes profuse use of three dimensional and two dimensional features, including patterns, lines and colors. For example, the Diesel Timeframes Mega Chief Chronograph Quartz DZ4478 Men’s Watch has round dial bears a high contrast with the extension above the crystal. The details are distinct and the dial outclasses the bland, formal look. It has high-class features that increase the confidence in its usage by watch lovers over the world. The Diesel Timeframes Mega Chief Chronograph Quartz DZ4478 Men’s Watch represents one of the superior styles of modern sophistication by both its definitions and standard. 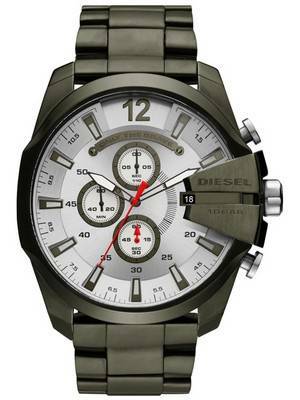 The Diesel Timeframes Mega Chief Chronograph Quartz DZ4478 Men’s Watch is for the man on the go! It makes quite a statement. It’s bold, brash and beautiful, with an urban flair that expresses the individuality of its wearer. It’s not strikingly bright; rather, it’s a combination of soft colors bringing out the subtle hue. The Diesel Watches comes with a wide wrist band that offers an extra grip. Seemingly, it’s a technology that’s fun and unique and gives the watch a distinctive look. The wide, bar-shaped hour markers adorn the dial’s periphery and the prominent 12O’clock keeps the monotony out. The minute-markers are fine but sharp, while the red accents keep things from turning drab. The sword hands are skeletonized halfway down while above, they are partly covered in lume. The chronograph is a decent one. It measures seconds, 1/10th seconds and minutes. It is enough to check lap times when you are watching F1 or doing some other job requiring time-measurement. The sub dial at 6 measures seconds; the sub dial at 9 the minutes and the 12’o clock counter measures 1/10th of a second. The two wide-topped pushers at 2 and 4 control the chrono. The solid, edged links of the band are connected in a three-in-a row pattern. At the end, there’s an easy-to-push, deploying clasp. The case and the bracelet are similarly finished, as the clamp-like protective structures on the crystal, separating the date window from the rest of the dial. That’s user-friendly viewing, no doubt. Bottom line: With every ‘Mega Chief’ model from the Diesel Timeframe series it becomes evident that the brand can focus on art and science in different manners every time, instead of following a set pattern. Better yet to say, the Diesel Overflow Chronograph Men’s Watch is how passion for crafting is depicted through a classic, sporty design. This entry was posted in Diesel Watches and tagged Diesel Timeframes, Diesel Watches on May 10, 2018 by citizenwatches. Industrial looks in gunmetal tone has always been men’s favorite. Add to that a dash of orange and things suddenly turned a lot more interesting. A dark, reserved ambience gets a vibrant, energetic touch and turns the Diesel Mega Chief Chronograph Black Dial 100M DZ4291 Mens Watch an everyday casual wear, ideally fit for styles in the between semi-formal and casual. The Diesel Mega Chief Chronograph Black Dial 100M DZ4291 Mens Watch is a fun-to-wear timepiece that rides the modern, industrial fashion trends. The craftsmanship is exceptional; it’s design, simple and up-front. An overall very dependable built, the Diesel Mega Chief Chronograph Black Dial 100M DZ4291 Mens Watch is perfectly suited for both day- and night-outs. The prime highlights of the Diesel Watches For Men are its large, round dial and its chronograph functionality. The orange burst is present in metered doses, brimming yet not overflowing from the areas in the dial they are contained in. The sudden, little bright burst of white on the small-seconds subdial brings the necessary break and keeps the orange tint from getting monotonous while the outer periphery of the dial shows the exact halfways between the hour-markers. The date window is cut out from the slightly-extended crown guard, which also bears the brand’s name and water resistance capacity. • Case: Pure stainless steel, rounded and polished, large size (51mm); with push buttons and crown made from the same material. • Band: Extra-wide (26mm), black, pebble-grain calfskin leather; clasp/closure made from ion-plated stainless steel. • Bezel: Fixed; ion-plated stainless steel; date display at 3 o’clock. • Dial: Dual-layer, brushed, colored in black and orange. Comprises Arabic hour marker at 12; lumed, orange index-markers; chronograph sub-dials (3), lumed hour and minute hands; covered with mineral glass. • Movement: Analogue, Japanese, chronograph quartz movement with 1/10th second counting capability; counts up to 60 minutes. • Water resistance: 330 feet. 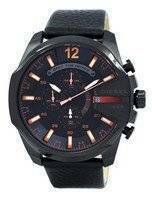 The Diesel Mega Chief Chronograph Black Dial 100M DZ4291 Mens Watch is unique! It can definitely be called a game changer with its bright, colorful accents and details that impart a fun, trendy look! The Diesel Master Chief Mens Watch combines polished and matte details to bring about a wonderful, dark after-hours effect. Its sheer size brings it the very masculine vibe while black leather puts a touch of luscious and refined aura like no other! Even if you spill beer upon it, it’ll be fine and a few bumps on the pool table are nothing that it can feel! The only glitch is how much ever you like it, you won’t wear it if you are less than an average wrist size! This entry was posted in Diesel Watches and tagged Diesel Mega Chief, Diesel Watches on October 16, 2017 by citizenwatches.